Sheffield FC manager Zoe Johnson could not help but ponder what might have been, after seeing her players miss gilt-edged chances in their home defeat by Durham. In the club’s first Women’s Super League 2 game they fell behind shortly before half-time with Jordan Atkinson on target. Sheffield carved out opportunities of their own, but Jodie Michalska and Ellie Gilliatt wasted chances to send the majority of the 474-strong crowd home happy. Johnson said: “It was a historic night for the club and the occasion might have got the better of the girls in the first half. “You could see there were nerves and they were not composed on the ball. They were giving it away and making silly decisions. “In the second half we were the better team. We had two or three clear cut chances and on another day they all go in. “So it was a disappointing result, especially on a big occasion. But now it’s about how the girls come back from it because we go again in three days. “It is our first time at this level, so we are not going to dominate games. But I think after the game now we look at it and feel like we could have taken something. 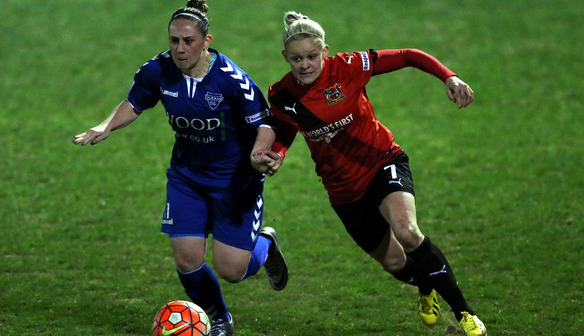 Durham had lost on the opening day of the previous two WSL 2 seasons. But a fine rearguard action after Atkinson’s first-half goal saw them pass a vital test of character, much to the delight of assistant boss Andy Thorpe. He said: “It was a fantastic result. We got the three points which we came here to do. It was hard, we knew it would be. The girls battled hard and saw it through to the end. “In pre-season something we worked on was the first five minutes in each half and the five minutes before half-time and full-time being the most important. So to see us get a goal in one of those periods is a dream come true because we’ve worked hard on it and then done it. “We rode our luck a couple of times, but that’s football. We’ve got a solid back four with a decent keeper behind them which makes a difference in this league. “Sheffield are new to the league and sometimes it’s hard to get recognised by the fans, but to get a crowd of 400-plus is really good form them. Subs not used: Megan Borthwick, Sarah Eadon.